Lil Learnerz look like big kid underwear and come in multiple fun prints! Lil Learnerz Potty Training Pants look like big kid underwear and come in multiple fun prints and vibrant color combinations. Lil Learnerz by the makers of Rumparooz and Kangacare are here to help your toddler hit the next milestone - potty training success! 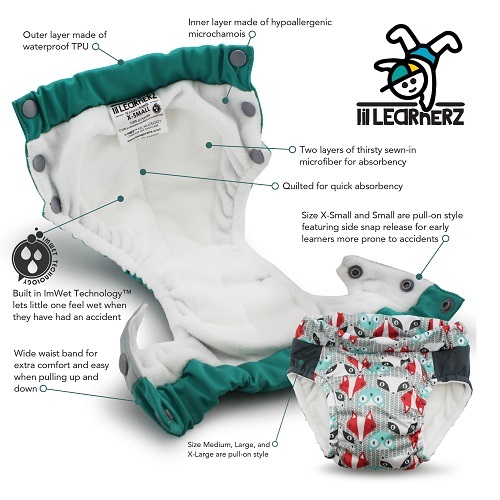 When your little one is ready to leave the diapers behind and move on to big kid undies but still needs help and protection, Lil Learnerz will become that essential aid for confidence and comfort. Lil Learnerz are made with IMWET TECHNOLOGY™! This innovative fabric feature lets your toddler feel wet when they have had an accident which helps them learn more about their bodily functions and aids in the potty learning process. Lil Learnerz training underwear are breathable and soft with a hypoallergenic layer that rests against your child’s skin. Lil Learnerz are also waterproof and can hold a heavy accident with no trouble so you won't have to worry about leaks and messes. The inside is made up of an absorbent, dual layer, microfiber core. Lil Learnerz are easy to pull up and down by your little one and feel just like real underwear! Your little one will feel proud and confident in their new REAL looking underwear! Five sizes for every stage of potty training! 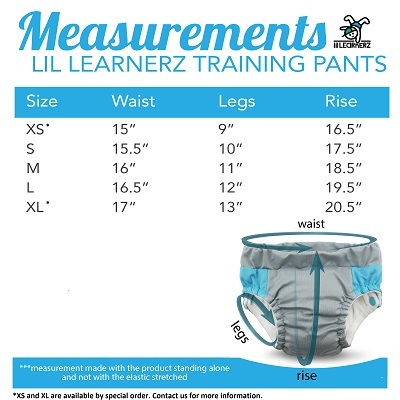 Lil Learnerz are available in five sizes ranging from XSmall to XLarge. The XSmall and Small size also feature side snapping release panels for easy-off in case of accidents with early learners. Size Medium, Large, & XLarge are Pull-up style. Rumparooz by Kanga Care cloth diaper wet bag has a unique HALF MOON shape to allow cloth diapering parents to store more wet cloth diapers until laundry day. We used these with our little one. She showed interest in the potty early (15 months) and it was hard to find trainer to fit her skinny waist. Now we use these daily at the babysitters. It helps her learn about wearing "undies" and using the potty while keeping messes in. The side snaps are great for #2 accidents and are stiff enough kids can't open them up. I will say they seem to be a tight fit, we use a 2T-3T on our skinny one, so if your child has cute baby rolls around the middle, you may consider going up a size! Son loves but maybe a little too much! These are great at containing any messes and my son loves them, but he loves them so much he never wants to take them off, which can be a problem if he's had an accident. They are also harder for him to pull down/up compared to some of the other training pants that look more like "real" underwear. Will hold an entire accident! I love other trainers we've tried but most don't hold a whole bladder, but these fit great and are waterproof to not leak but still make being wet uncomfortable. They are great and definitely one of my top choices. We've used and loved Kanga Care products for 8 years and I couldn't wait to try the new Lil Learnerz! They are so cute, fit really nicely and are super trim and have all the absorbency and effectiveness I've come to expect from Kanga Care. I highly recommend these! My little learner loves hers!